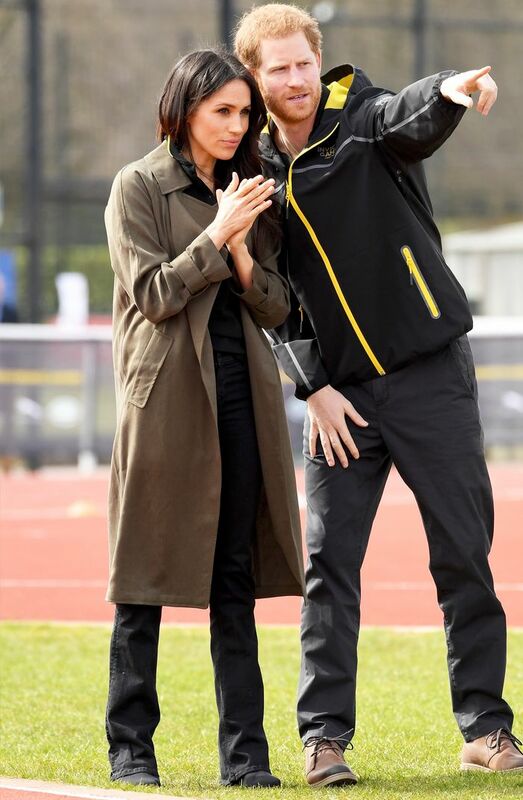 Today Meghan Markle and Prince Harry attended the UK team trials for the Inviticus Games. Meghan wore an Inviticus-branded polo shirt, but that's as far as she went with the sportswear theme. Instead of wearing a practical waterproof like Harry, Meghan looked polished in the one thing that has long been considered the ultimate spring must-have—a trench coat. Meghan wore a dark brown knee-length trench by the brand Babaton for Aritizia, worn with a pair of black bootcut jeans by her go-to denim brand Mother. In September 2017 at the Invictus Games in Toronto, where the couple made their first public appearance together, Meghan wore a pair of blue Mother Denim jeans with rips at the knees. The day after Mother's website traffic increased by over 200%, and the brand experienced a stellar October, beating its own sales forecast by almost 20%. Keep scrolling to see Meghan's latest look and shop her trench below.